Successfully Added Professional Walkie Talkie Set - UHF FM Transceiver to your Shopping Cart. Professional UHF FM Transceiver Walkie Talkie Set. Ergonomically designed pair of powerful two-way walkie talkies also known as HT's (handheld transceivers). These portable walkie talkies, also called 2-way radios in some countries, will provide the flexibility of keeping in touch without relying on a cellphone. These walkie talkies would be ideal for both business and personal use. These would be convenient for maintaining contact in busy, crowded areas such as trade fairs within large conference centers. Easy to use but very powerful, these radio walkie talkies would also be ideal for security personnel due to their reliability, clarity and a long operational range of approx. 3KM. This powerful 4-channel, twin walkie talkie set is brought to you complete with NiMh batteries and recharging dock. 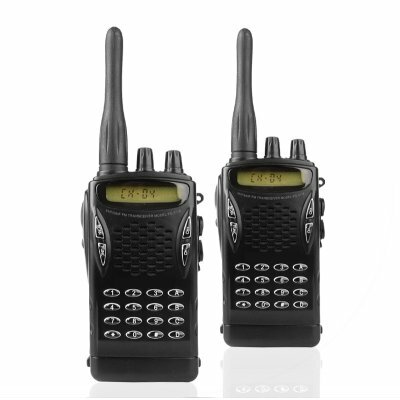 This Walkie Talkie set has a high reselling value and a low weight for easy direct shipping. So order yours today! Note: This item only works in countries with AC power from 220-240V. If you need a 100-120V version then please contact our customer service team. on 2010-01-21 21:55:39 VERY GOOD !!! PRODOTTO DI OTTIMA QUALITà E PREZZO ECCEZIONALE. CHINAVASION THE BEST OF WHOLESALE ELECTRONICS. The PG-5118 is one of the best Walkie Talkie Set . we are surprise for quallity and price.